Friday April 6th 1894 Will was working in the berry patch in the morning and I helped with it. In the afternoon we went to the valley to see how Will Anderson was. He has been very sick. Father & Mother had been there but we did not see them. I churned after I came home and fixed yeast to bake bread. 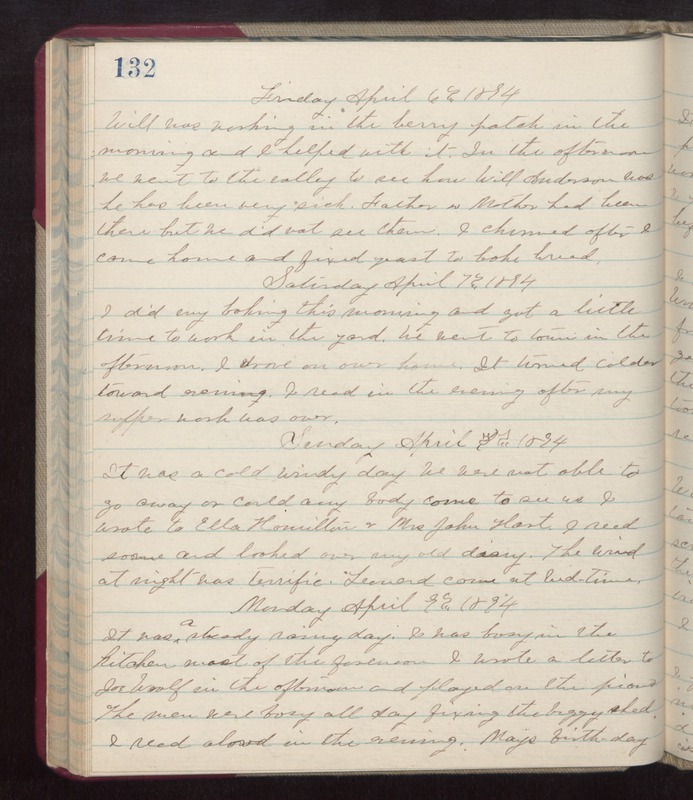 Saturday April 7th 1894 I did my baking this morning and got a little time to work in the yard. We went to town in the afternoon. I drove on over home. It turned colder toward evening. I read in the evening after my supper work was over. Sunday April 8th 1894 It was a cold windy day. We were not able to go away or could anybody come to see us. I wrote to Ella Hamilton & Mrs John Hart. I read some and looked over my old diary. The wind at night was terrific. Leonard came at bedtime. Monday April 9th 1894 It was a steady rainy day. I was busy in the kitchen most of the forenoon. I wrote a letter to Joe Woolf in the afternoon and played on the piano. The men were busy all day fixing the buggy shed. I read aloud in the evening. May's birthday.